Will Super Bowl XLVI be Tom Coughlin's Final Game? 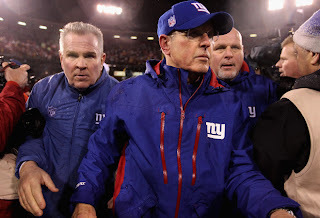 Seems like every year there is some chatter about New York Giants head coach Tom Coughlin will retire. but he's kept on plugging away, even as fans occasional call for his firing. But as the oldest active coach in the NFL prepares to lead his team to another Super Bowl showdown with the New England Patriots, could Super Bowl XLVI be his final game? Coughlin has been coaching every year in some way or another since serving as a graduate assistant at Syracuse University in 1969. That means he has been coaching longer since Dennis Allen, the newest head coach of the Oakland Raiders and the youngest head coach in the NFL, has been alive. He has built a reputation as a hard-nosed, extremely disciplined head coach who has seen his fair share of success in this league. He was the first coach of the Jacksonville Jaguars and took them to the AFC Championship Game in only their second year in existence, he then took them to the playoffs three more times, including the AFC Championship Game again after the 1999 season. He then became the coach of the New York Giants and won Super Bowl XLII after the 2007 season. I personally think Coughlin will retire after Super Bowl XLVI, particularly if the Giants come out victorious over New England again. It's been my opinion this season that the 65-year old will hang it up partly due to age, partly due to being tired with the New York media, which can wear out any head coach. And I further my opinion after he suffered a leg injury against the New York Jets. Even as he turned out to be completely fine, one has to wonder what other potential injuries can happen to an older coach, as we've seen more coaches getting injured on the sidelines of late for reasons I cannot explain. If the Giants fall to the Patriots on Super Bowl Sunday, I think that there will be an urge for him to return because who wants to come so close to another ring and fall just short and end like that. But if he wins a ring,, which will give him the same amount that Bill Parcells had in New York, I think he'll end his strong coaching career on the best possible note you could finish on.